©Bert Gildart: Ain’t he a handsome dude with his bald head, see-through nostrils, and hook-like point on the end of its beak? If you haven’t already met this character, take time now to acquaint yourself with the turkey vulture, a fascinating bird you’re likely to see right now no matter where you might live in North America. And, really, despite looks, he’s not evil as he might appear. Just keep in mind, however, that this bird has never been accused of having good table manners. That’s something you may learn if you live in the Northwest, for young have probably hatched by now, though will remain in their nest for a few more weeks. If you find one, watch out, particularly if it’s protecting young, else you might depart smelling like you’ve been rolling in meat that has putrefied. Turkey vultures, in fact, may be the king of bad table manners, but then imagine for a moment how poor etiquette could help them out. If a predator approaches, rather than leave his table, and the dead creature upon which the vulture is feeding, this baldheaded bird simply regurgitates its food, often onto the creature that wants to make a meal out of it! And the contents can be vile. In fact, the semi-digested material can almost blister the eyes of a predator. The technique is also used to protect its young, and works particularly well for nests located high off the ground, for unable to project its vomit, the vulture simply coughs up its semi-digested materials, and lets it fall. If you’re beneath it, watch out! 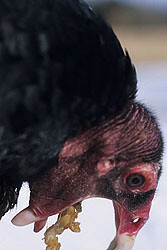 Sometimes turkey vultures use the technique of coughing up food to rid its crop of heavy, undigested foods. If it were unable to do so, the bird would weight too much to lift off, and that could be disastrous for the vulture. At this point, predators often give up their pursuit of the vulture in exchange for a quick meal of semi-digested material. OK, enough of the gross (but fascinating) aspects of the vulture. Let’s take a look at their see-through nostrils, the means by which they so efficiently locate their food. Noses, you can see, are large, and the appropriate portion of the brain is correspondingly large. In fact, the part of their brain responsible for smell is larger than that of most other birds. Turkey vultures look for food by soaring on long outstretched wings, and you’ll differentiate the bird from other species by the “V” shaped configuration of their wings. Biologists call this pattern a “dihedral” configuration. Often when you see a vulture, it’ll be gliding fairly low to the ground, but its sense of smell is so strong it can actually pick up the odor of a dead animal in a forest of trees. If you live in North America, keep your eyes open for this bird is a summer resident throughout the entire country. That means you could see one now, but remember, if it’s in a tree and nesting, don’t stay around long or you might find yourself covered with all sorts of semi-digested materials. This entry was posted on Monday, June 11th, 2007 at 6:50 am and is filed under Natural History/Conservation. You can follow any responses to this entry through the RSS 2.0 feed. You can leave a response, or trackback from your own site. 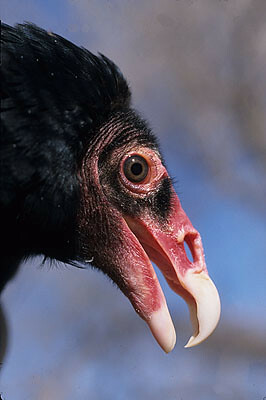 Read your Turkey Vulture piece linked off of Rich’s blog. Fascinating article and I am going to make sure and give them a wide berth next time I’m in their vicinity! Look us up next time you’re in California. Would love to have you and Janie courtesy park at our place.